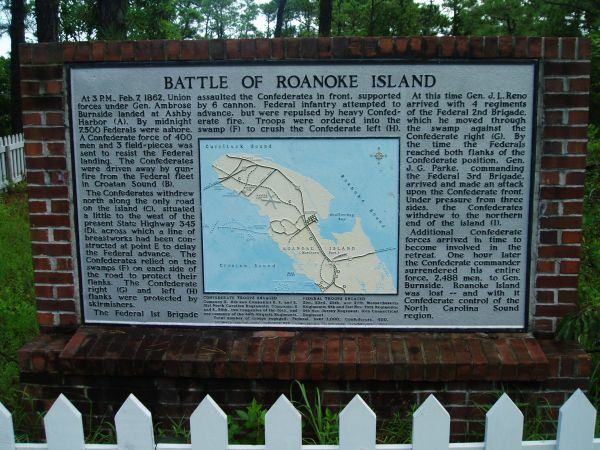 Introduction: The Battle of Roanoke Island, part of Burnside's North Carolina Expedition, has been overshadowed by more well-known battles of the Civil War, but it was a vital island fortified with formidable forts which had to be subdued by Union forces in order to push inland. A fort is generally constructed in a strategic area which must be defended, so to place a string of defenses, known as fortifications, along an island gives the impression of vital interests in the region, and that was the definition of Roanoke Island. 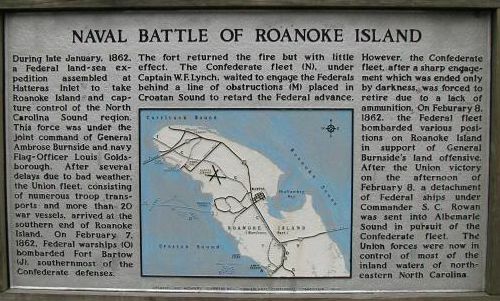 Although the Union army required a lengthy voyage to arrive at the North Carolina coast, to march across the State meant that it had to first subdue Roanoke Island. Early in the war the Union Navy implemented Gen. Winfield Scott's Anaconda Plan, which was designed to strangle the Southern economy by blockading its coasts and ports, thus stripping it of the ability to transport and receive the much needed goods to prosecute a war. Roanoke Island is rich in history and it played a prominent role in the settlement of the United States. The maps and photos of the Confederate held island show its crucial location to North Carolina's coastal plains region. To arrive at the island was hazardous, for each ship had to navigate the Atlantic Ocean, pass the Old North State's barrier islands, and then turn inland and steam along the narrow inlet while be subjected to mines, called torpedoes at the time, and numerous land and island based artillery fire. To arrive at the harbor was one objective, but to hold Roanoke Island was another subject. Roanoke was mosquito infested, miserably hot, and always humid. To Northern soldiers and sailors, it was unlike any location that they had experienced. During their visit they would also be welcomed by a host of diseases which would kill more of the Union troops than all other causes combined. While the history is told with many maps and pictures, you are encouraged to imagine living in a fort on the island while fighting the elements and engaging in guard and drill duty to battery and small arms fire, and then having limited rations and water as you are fighting disease without proper medication. History: On February 7, 1862, Brig. Gen. Ambrose E. Burnside landed 7,500 men on the southwestern side of Roanoke Island in an amphibious operation launched from Fort Monroe. The next morning, during Burnside's North Carolina Expedition, the Federals, supported by gunboats, assaulted the Confederate forts on the narrow waist of the island, driving back and out-maneuvering Brig. Gen. Henry Wise’s outnumbered command. After losing less than 100 men, the Confederate commander on the field, Col. H. M. Shaw, surrendered about 2,500 soldiers and 32 guns. Burnside had secured an important outpost on the Atlantic Coast, tightening the blockade. Roanoke Island also was a strategic objective in Gen. Winfield Scott's Anaconda Plan. By late spring 1862, Union soldiers occupied Hatteras Inlet and controlled the towns of Plymouth, Washington and New Bern. The loss of most of the North Carolina coast and coastal waterways was a blow both to Confederate morale and the young nation's ability to supply its armies in the field. But aside from a few raids from those bases, the Union forces didn't advance until Sherman entered North Carolina in March-April 1865, in what is commonly referred to as Sherman's March. The Outer Banks of North Carolina were the setting for important conflicts during the Civil War. 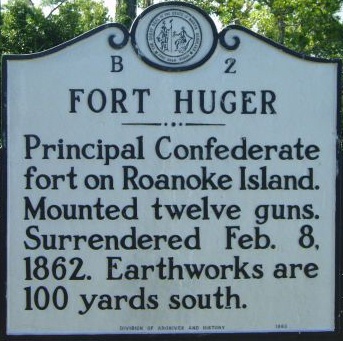 Union victories at Hatteras Inlet and Roanoke Island early in the war placed the area under Federal control and extended their blockade of the southern coast. The Federal campaign began on August 27, 1861, with an amphibious assault by Commodore Silas Stringham and General Benjamin Butler on two small and lightly defended forts at Cape Hatteras. The Confederate government had placed a higher priority on the conflicts in Virginia, and thus had made little effort to outfit and maintain these forts. The poorly-trained and poorly-equipped Confederate militia and recruits manning them were also plagued by thirst and mosquitoes. The Federals took both forts in less than 48 hours, and not one Union soldier was killed. The entire Pamlico Sound north to Roanoke Island was now open to Union activity, and for the Confederates the great highway linking coastal shipping to the rivers of interior North Carolina was beginning to close. A few months later, the Union assembled another fleet, this time for an attack on Roanoke Island. Since the fall of the Hatteras forts, the Richmond government had done little to strengthen the defense of Roanoke Island. There were three small earthen forts on the island, with a fourth position west of the island across Croatan Sound (north of the current Manns Harbor Bridge). Because the Confederate general staff was expecting a Union attack from the north, most of their artillery pieces were pointed in that direction and could not be turned to face an attack moving from the south in Pamlico Sound. 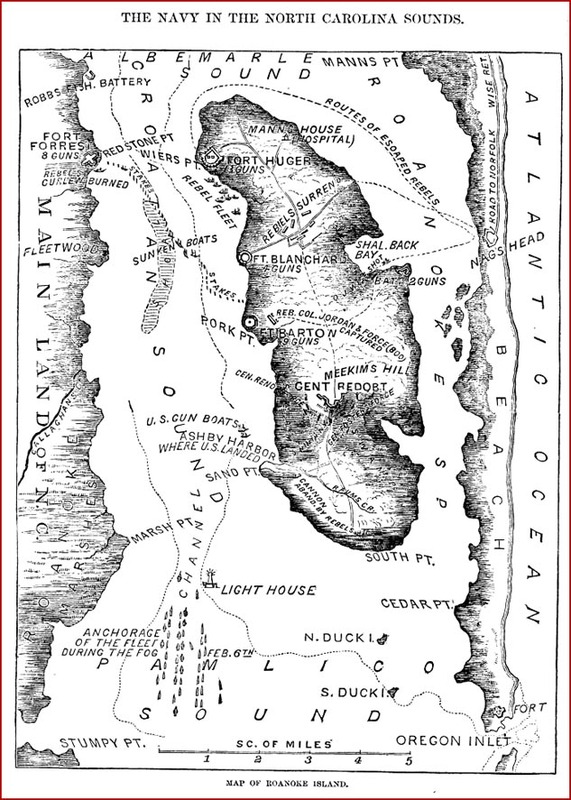 (Right) Map of Union and Confederate warships and gunboats in offensive and defensive positions for the imminent Battle of Roanoke Island. Due to the Confederate government's commitment to the defense of Richmond, only 1400 soldiers were made available to hold the strategically important island. After struggling south from Annapolis, Maryland, through a series of winter storms, Union General Ambrose Burnside led a fleet of 67 ships and 13,000 men through Hatteras Inlet and dropped anchor off the western shore of Roanoke Island on February 5, 1862. He landed 4000 soldiers at Ashby Harbor and after slogging through the swamps assaulted the Confederates' makeshift position near today's intersection of U.S. 64 and N.C. 345. On Croatan Sound, the South's five-vessel "Mosquito Fleet" harried the Union ships as best it could, but it was badly battered and quickly driven north out of range. The island's inexperienced defenders fought tenaciously behind their earthen fortifications but were eventually outflanked and overwhelmed by Burnside's veterans. Few on either side were killed, and the Union forces eventually captured the entire Southern defense contingent. The "Mosquito Fleet" temporarily escaped to the north, but was destroyed a few days later during the Battle of Elizabeth City. 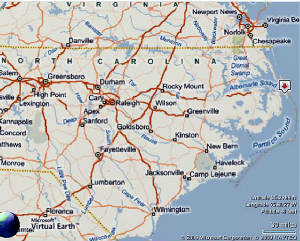 The Union now controlled North Carolina's sounds and access to the state's interior shipping routes. It was a devastating loss. The Federal campaigns on the Outer Banks helped accomplish President Lincoln's goal of a blockade of the Confederacy's coastline, and helped foster cooperation and coordination between the Union's Army and Navy. Today, only one of the Confederate defensive sites is accessible to visitors. Remnants of the ramparts near the U.S. 64-N.C. 345 intersection can be seen and parking is available about 100 yards south of the intersection. The three island forts, either worn down over the years or washed away into Croatan Sound, are commemorated by historic plaques and street names throughout Roanoke Island. See also Battle of Roanoke Island: A History. (About) Map of Union and Confederate warships and gunboats maneuvering for the imminent Battle of Roanoke Island. Harper's New Monthly Magazine December 1865, Vol. 32, Issue 187, p. 575. Sources: National Park Service; Fort Raleigh National Historic Site; Official Records of the Union and Confederate Armies; New Bern Historical Society; North Carolina Civil War Tourism Council, Inc; North Carolina Museum of History; Maps courtesy Microsoft MapPoint and Microsoft Virtual Earth (3D). Related Studies: Burnside's North Carolina Expedition, CSS Albemarle: Her Characteristics and Service, Goldsboro Expedition, and American Civil War Generals Appointed by North Carolina.